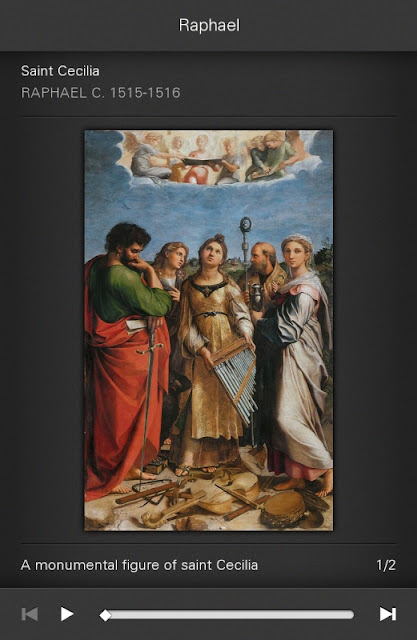 The Late Raphael app was created by the Louvre and its partners for the Paris leg of the exhibition which had commenced at the Prado in Madrid. The following post is a review of this application, based on the Android version. An iOS variant of the app designed for use on the iPhone, iPad (etc.) is also available (see links). 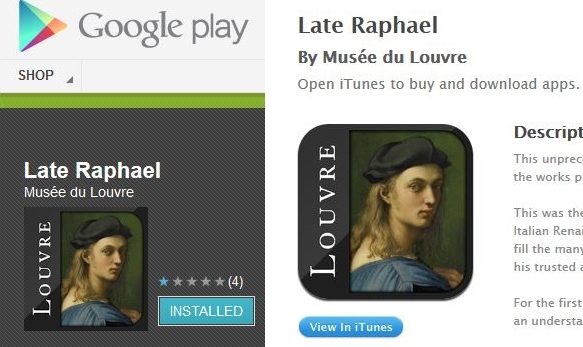 The Louvre's Late Raphael is the first official application created for an exhibition of Raphael's works on the Android and iOS platforms. The app is available globally on the Google Play and iTunes stores, extending the exhibition's audience beyond museum attendees. 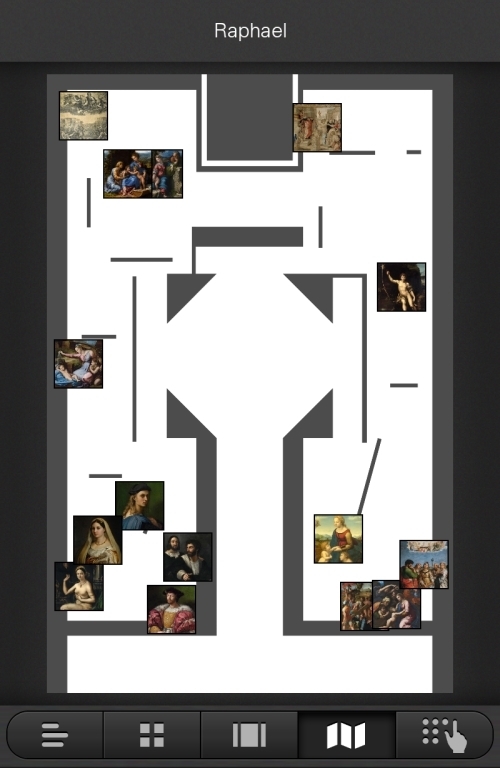 *Is the app designed to supplement or enhance exhibition content when viewed on site? *Is the app intended as an offline resource or means to preserve an aspect of the exhibition? *Does the app require an active internet connection to function? nb. For more on how leading museums are approaching participatory experiences, including apps, see "essential reading" below. It appears the Louvre and their partners were aiming for a middle ground. The app does contain an overview of the exhibition, and audio guides for key works, including related pieces on show, plus a floorplan. Each of the paintings described have at least one audio commentary, with some entries having an additional track providing further background information. The selected pieces represent a diverse range of works, including a drawing and paintings attributed to members of Raphael's studio, providing a representative sample of the exhibition content. The application requires an internet connection for initial download, but afterwards has the ability to function offline (namely, all data is downloaded to the device upon first use). 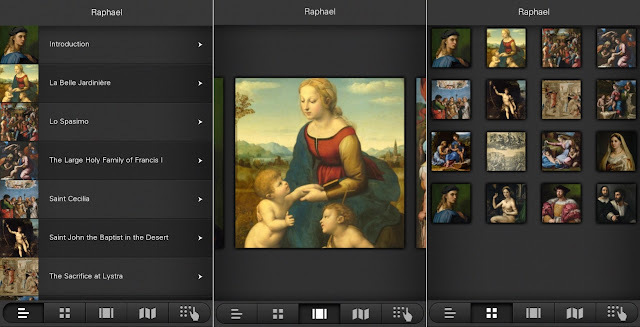 The Late Raphael app uses an attractive visual navigation system. allowing works to be shown in a list, grid, or slide show view for easily selection. A floor plan view is also present, giving a very basic overview of the works' positions within the exhibition space. This unprecedented exhibition, organized by the Louvre in partnership with the Museo del Prado, brings together the works produced by Raphael in Rome during the last years of his short life. This was the period in which Raphael style attained its full maturity, marking without a doubt the apogee of the Italian Renaissance. But he was far from a solitary genius. He worked with the aid of numerous disciples in order to fill the many commissions he received. Other hands therefore often had a part in his creations, especially those of his trusted assistants, Giulio Romano and Gianfrancesco Penni. For the first time, the master’s works are presented alongside those executed by his pupils. The aim is to facilitate an understanding of the extent of involvement of Raphael and his collaborators. • Discover the fascinating facts behind the masterpieces on display with the help of curator Vincent Delieuvin from the Louvre Department of Paintings, who also curated the exhibition. • Exploring sixteen key works, Vincent Delieuvin discusses major themes of the exhibition such as Raphael’s years of maturity in Rome, the significance of the master’s workshop and the prominent role of Giulio Romano and Gianfrancesco Penni, his principal assistants. During those years, in around 1507 to 1508, he was completing his period of training in Florence. He'd been at the Tuscan capital for 3 or 4 years, he was about 20 years old, and he had completely absorbed the examples of his elders. Chief among these was Leonardo da Vinci, who'd welcomed Raphael into his workshop, showing him his drawings and compositions. Such statements are often presented as facts with their origins (usually) found in Vasari's Lives of the Artists. However, a discerning review of the literature presents a more complex picture. Raphael's first documented commission extends back to an altar piece painted for Baronci chapel in the Church of Sant' Agostino in Città di Castello. This contract names him as magister (master) in December 1500, working with Evangelista di Pian di Meleto, a painter known to have worked in Raphael's father's workshop. The exact nature of Raphael's training, the subject of debate in the past, continues to be a source of passionate exchange among critics. The apprenticeship phase, together with the so called Florentine years, the decade or more to 1508, is rich in art-historical problems. [...] Francis Russell has sough to clarify Raphael's relations with Perugino in the 1490s, effectively putting to rest Vasari's account of Raphael's training. 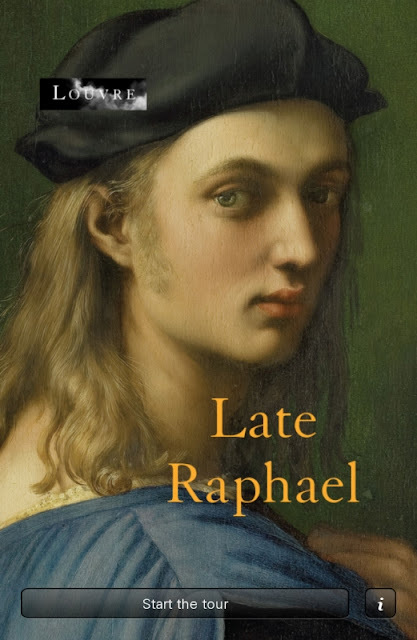 He makes the convincing suggestion that Raphael was with Perugino as early as 1496, which would have placed him in a bottega at about age thirteen, several years after his father's death. Thus he would have been sent to Perugino by uncles on both his father's and his mother's sides. It is fair to add that such an early working arrangement between Raphael and Perugino was not agreed upon by all participants, although it seems to have been a common assumption in the early sixteenth century. 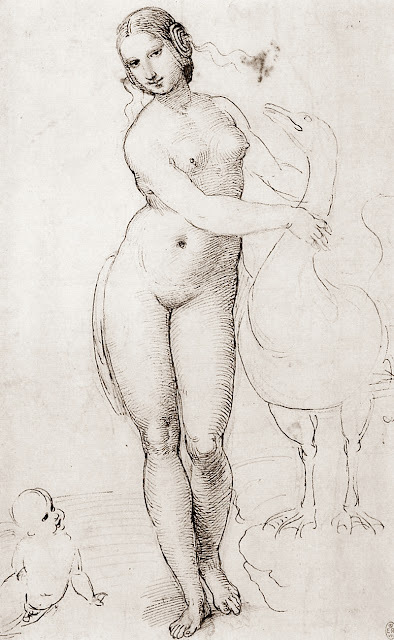 Leo X is actually quoted by Sebastiano del Piombo as saying that once Raphael saw the works of Michelangelo, he dropped his "maniera del Perosino." Raphael's paintings and drawings confirm an exposure to Leonardo's works, although the exact nature of their interaction is not known from documentary sources. The Android version of the app used for this review displayed a glitch, with the app switching off if the screen has a sleep setting (set for 10-30seconds on most devices). This made using the app very difficult, but was fixed in an update released some weeks after launch. The Android version of the app is not designed for tablet devices. The iOS version states compatibility for iPhone, iPhone, iPod Touch and iPad devices. The Louvre's Late Raphael app was created to supplement the visitor experience for those attending the Paris exhibition. Beyond this, it acts to preserve a selection of the works and themes explored in the landmark exhibition. The level of detail presented in the app targets general users, with some inconsistency found in the quality of factual content presented in the discussion. A clearer description of the application being an audio guide in the title would be desirable for future efforts, with initial glitches and device restrictions noted in the Android version also hampering user experience. 1. App development credited to Tristan Interactive Inc., and Espro Acoustiguide SAS, in partnership with the Louvre. 2. Description from Late Raphael app from Google Play site. 3. Quote from Late Raphael app. English translation for La Belle Jardiniere entry. Original speaker in French is Louvre curator of paintings Vincent Delieuvin. 4. Henry, T. Raphael's altar-piece patrons in the Città di Castello. The Burlington Magazine. Vol. 144, No. 1190. May, 2002. pp. 268-278. JSTOR link nb. Provides a concise summary examining literature and sources discussing the patrons of the Città di Castello altarpieces, particularly the work of Magherini Graziani. 5. Beck. J. (ed.) Studies in the History of Art. Raphael Before Rome. Vol. 17. National Gallery of Art Washington. p.7. quotes Francis Russell's essay in the same publication: Perugino and the Early Experience of Raphael. pp.189-201. nb. It is important to note a deeper context behind Sebastiano's comment to Leo X, owing to the great rivalry exhibited between Raphael and Sebastiano at the time, with extant documents revealing Sebastiano and Michelangelo exchanging emotionally charged, somewhat conspiratorial letters about their rival in Rome. For more in this see: Barbieri, C. The Competition between Michelangelo and Raphael and Sebastiano's Role in It. In: The Cambridge Companion to Raphael. Hall, MB (ed.) Cambridge University Press. 2005. pp.141-164. Thank you for this Hasan! What a unique opportunity for you to demonstrate your fluency on both Raphael and the new types of content now starting to trickle out from official organisations. I paused for a moment while reading this, as you presented the details of Raphael's first (surviving) contract. What a luxury it is for readers to access this level of detail in a blog post, and an app review. It seems you move effortlessly through these layers of knowledge. Nice to see an app review in the mix. I suspect the standard audio guide given out by the Louvre shared the same content as the app, but the app was cheaper and a whole lot sleeker. (The Louvre audio devices were bulky Nintendo affairs - I felt very smug with my Android). I was disappointed that the app didn't offer any additional content beyond audio, especially because for those not fluent in French (I am shamed to admit), there was nothing else available - no printed material for sale nor English commentary in the exhibition. This left gaps in commentary for works not included in the audio. In conclusion I felt very grateful I had the app otherwise I'd have nothing, but repeatedly feeling I wanted more out of it. @Stephanie - I was pleased to receive many requests to review this app! The initial glitches were not pleasant, yet once overcome the app's visual format was pleasing enough. All in all a positive step forward by the Louvre and their partners, but some room for improvement of course. @27a5d48ca7dc840bf1f28aeb7aa8c603:disqus I heard about the scarcity of English resources, including the Louvre themselves running out fo English copies of the catalogue (one is not suprised really...!) In this context having the app on hand would have been handy - and hopefully you were not plagued by the screen off glitch on your device. I hope to do more app reviews in the future for content relevant to Renaissance art etc.